According to members of this internet tribe, which largely identifies with so-called “alt right” white nationalism, Donald Trump will become the 44th President of the United States thanks to their viral efforts with a cartoon frog. On the morning of November 9, Théodore Ferréol sat in front of his computer in Paris and wondered what had just happened. Ferréol is not an American citizen and so hadn't voted for Donald Trump personally. But as an occult researcher, he knew about those who claimed responsibility for Trump's upset election victory: an online group that spreads images of a cartoon frog. This group largely identifies with the so-called "alt right", a white nationalist group, and believes the frog, named Pepe, is imbued with a magical power to bring Trump into office—as long as devotees plaster the frog's image everywhere, like a flyer for takeout food. "I've been observing [this phenomena] first hand for quite some time now," Ferréol told me. "And I'm fascinated at the way internet folklore is turning into something new—not exactly activism, not exactly religion, but something close to a new form of magic and animism in an era when communities have transformed into tribes. And they are savage, creative and, as we now know, really powerful," he added, referring to the online communities where Pepe is literally considered a god. In the case of Trump's victory, though, the supposedly responsible image is Pepe, who's widely seen on social media. This is a new era of chaos magic, fueled by viral sharing: enter the world of meme magic. According to this occult online army, Trump is set to be sworn in as the 45th President of the United States thanks to their viral efforts. Not the economy. Not voter psychology. Not Paul Horner, purveyor of fake Trump news. But a frog meme. Not just any old frog, though. And that's something both sides of the debate will argue. Oren Segal is director of the Center on Extremism, a wing of the Anti-Defamation League. Segal maintains a database of over 200 memes which he says "put hate on display." Pepe is one of those memes, but Segal is working closely with Matt Furey, the frog's creator, in order to "reclaim" Pepe for less contentious causes. "I know him well," Segal said, referring to Pepe. "Even in our database we mention that there are so many ways to use the symbol. A lot of good people use this frog. That's the concept of a meme, it can be manipulated." Segal said he first looks at the frequency and volume of a meme being broadcast on various social media channels, especially Twitter. "Once extremists started using it, we added it to our database," he added. When I asked Segal if these groups were in fact extremist, he didn't miss a beat. "A lot of good people use this frog. That's the concept of a meme, it can be manipulated." These practitioners of meme magic include Lawrence Murray, a prolific "alt right" blogger who's posted FAQs about white nationalism and whose Twitter avatar features Pepe riding a white horse. Motherboard reached out to Murray to find out whether he and others like him were linking a Trump vote to a larger agenda. Fittingly, Murray and several of his peers replied to requests for comment only via Twitter by sending multiple examples of what they considered to be the most potent meme magic. Other public figures, like Jordan Peterson, a popular psychology professor at the University of Toronto, have found their social media accounts caught up in this meme magic whirlwind. After Peterson posted a video of himself wearing Canadian aboriginal headwear in the shape of a frog, his followers in the Pepe-for-Trump camp erupted, claiming that the cartoon frog was speaking through Peterson. Peterson is currently embroiled in an academic debate with university administrators over what constitutes the goal of modern higher education. He could not be reached for comment before publication. This last point is crucial, however, because occult followers of Pepe have latched onto Peterson and, of course, President-elect Trump for similar reasons: They view Pepe as an anti-establishmentarian fighting for truth, in alignment with other truth tellers. Trump himself seems to be aware of this community, if tweeting a version of himself as Pepe—a move that prompted Hillary Clinton to issue a denouncement of the meme—is any indication. And so began the idea that plastering Pepe everywhere would guarantee a Trump victory. The rabbit hole goes deeper. Pepe's followers look for synchronicity everywhere, building up a mythos from something that began as an innocuous cartoon character. This is the power of meta-history. 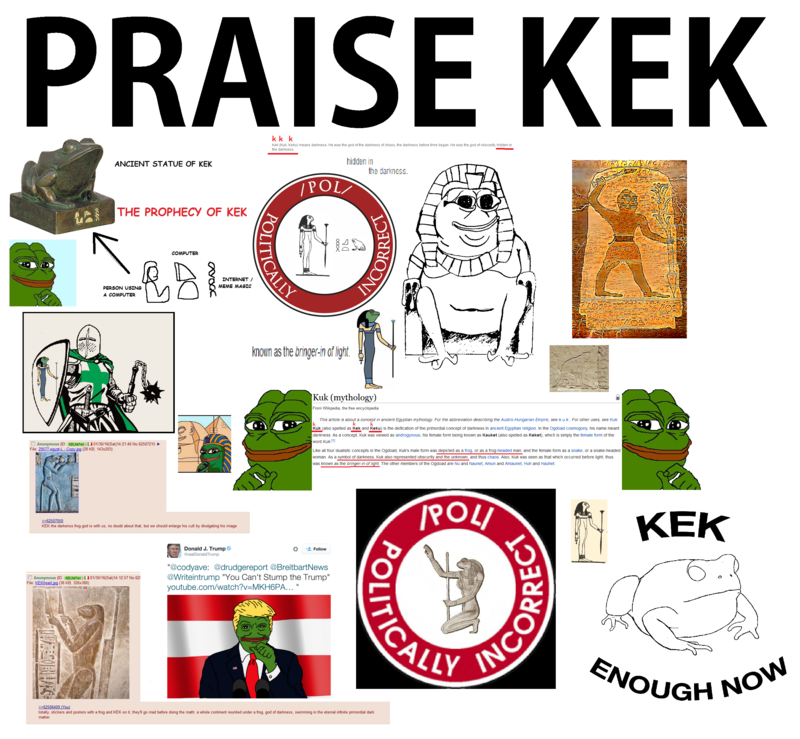 When residents on notorious image-based online bulletin board 4chan dug up an Egyptian frog god named Kek, they learned he was a disruptive deity that shakes up basic etiquette and assumptions. Thus they reasoned: Pepe is just a modern day Kek, and both of these frog gods are like the iconoclastic Trump. From there, these same 4channers have found other strange frog connections, and gotten into the habit of making an unusual kind of bet. When someone posts a message or picture on a 4chan thread, their entry is marked with a multiple-digit, randomly-generated number in the comment thread, like a personal UPC. In other words, no one knows what the number will be beforehand. So Pepe enthusiasts started betting that posts featuring Pepe would end in double digits. When those posts did in fact end in double digits, the community believed to have found its greatest validation yet. It was as if the internet was saying yes, meme magic exists, and the electronic medium is standing by to spread the message that Donald Trump should be president. Is meme magic real, or pure delusion? Whatever the case may be, there has been no shortage of warnings about computer intelligence advancing to a level where it mimics humankind's need for religion and interconnected meaning. Take HyperNormalisation, a recently released documentary that's partly about the impact of computer intelligence on present day politics. Adam Curtis, the widely respected documentarian and meme aficionado behind HyperNormalisation, opens the film with Trump's younger years in the 1970s, a time when New York City was bankrupt and transitioning into an era of algorithmic stock trading on Wall Street. Similar technology paved the way for Trump's future rise, Curtis suggests. We also learn that Judea Pearl, who developed the probabilistic approach to artificial intelligence, is the father of Daniel Pearl, the Wall Street Journal reporter who became the first viral beheading victim of Web 2.0, in 2002. From that point on, Curtis argues, nearly-unbelievable scenes of gore were transmitted into every American household. This kicked off a new discourse on terrorism, which some theorists have relied on by arguing that the media-saturated West has "invented ISIS." From this perspective, it's not difficult to see how an internet crap shoot fuels religious fervor in people. This is exactly the high people feel when they bet that a 4chan post on Pepe will end in double digits. The randomly-generated post number is not merely a probability to this crowd; it's a ghost in the machine, as if the algorithms are anticipating where human consciousness is going. So is meme magic dangerous? Curtis suggests it is, but uses a phrase familiar to government intelligence communities to describe the phenomenon: "perception management." Back in Paris, Ferréol mulls over the potential endgame of this phenomenon. He's not a Trump supporter and claims to be more of a passive observer. "I think meme magic is going global," Ferréol told me. "And I think that believing in meme magic is a motivational key to success." According to him, creating a meme of Clinton and a cat is not the same thing as building an entire mythology around Pepe. "These people are channeling power." "For me, Trump is not only the new president," Ferréol said. "He's the new Slender Man."